You are here: Home / Diary / My Secret Paws Package – Revealed! My Secret Paws Package – Revealed! The votes are in! I knew I could rely on you kitties! Exactly when is Catmas Day? WOW! Look at all this awesome stuff! My favorite treats! And nippy fish and an eco-friendly wand toy and lots of other cool things! Plus a kitty Catmas card with a sentiment that perfectly fits the season! With holiday greetings from Nikita, Elvira and their human, Kiril! The Hide ‘N Play toy needed some assembly, so I had to supervise my human very carefully. You know how bad she is at these things. But she managed to do it right! Thank you so much for these gifts, Nikita, Elvira and Kiril! And I promise to share them with Binga and Boodie. Sometimes. And while I am here, could I please ask you to send some purrs Kiril’s way? He is having some serious medical issues right now, which he talks about on his own human blog. Although he is keeping a good attitude about it, he really could use lots of positive energy from all of you! Mowzers, sending him many many good purrs! Sounds like he has two very good options for his eye melanoma – the external beam radiation therapy is incredibly precise these days (that’s what our daddy does) so we’re wishing for the best from him. MD Anderson is a fab place, so he’s surely living in the right town! What a haul! Yous really gots some pawsome presents from Nikita, Elvira and their human, Kiril! Concatulations on your gifts, Sparkle! Purrrrrrrrrrrrrrs and Merry Christmas! We will send him some good purrs! Any Human that packs up all that cool stuff deserves all the purrs he needs! It is very nice of you to share Sparkle. That is, if you’re not just saying that because you HAVE to. Which I think you might be. Wow Sparkle, what a haul! You are one lucky cat. What a wonderful Secret Paws package. We’re purring for Kiril. 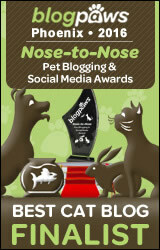 Pee ess – several kitties have already guessed that you’re our Secret Paw! It’s so tough keeping a secret on the CB. Awesome package. Sparkle pls share! Healing Purrs to Kiril. We are so glad you liked it! We loved the pics! What a pawsome package. You made a good score! That’s some amazing stuff you got, Sparkle! And we are purring and praying real hard for Daddy Kiril. Yay! You opened it. What pawsome presents. Happy Catmus! Cool hiding place! TBT put OUR Secret Paws package in the attic where were cant sniff it or even see who SENT it yet. Hes gonna make us wait til its at least officially Winter. Holy cats, what a bounty! Very very cool! You are being such a sweetie to share your toys, even sometimes. You must know Santa is still watching you! That is a great package Sparkle! We like the Catmas card too. whoa you scored big on that package sparkle. after you’re through playing with all the toys, the box give you more enjoyment. Those were all wonderful gifts from a very wonderful bunch!!! What a wonderful post. Looks like some great goodies. Thanks for your comment on our blog this morning and commiserating about the Christmas card debacle….. It seems your human and ours have lots in common. Sending Kiril purrs. What a great haul of goodies! Enjoy!!! We visited Kiril…he’s an inspiration. BIG purrs and prayers to him. Those are pawesome gifts! It’s nice of you to share with Binga and Boodie too! We’re sending purrs to Kiril. What a great Christmas parcel Sparkle – you’ll be able to hide from Binga in your tent! 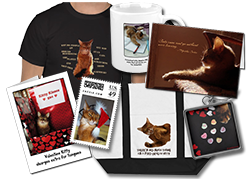 That was a great package…..
we are sending purrs to Kiril…. These are brilliant! Most wonderful. And now I have a similar parcel issue here – Ã„iti says MY parcel must wait until Christmas day. How mean is that ? Lots of cool stuff in that box! Especially love the tent! Have fun playing with everything! Wow! That’s some cool stuff you got, Sparkle! Have fun with it!! Oh goodness, that is one great Secret Santa package. Love your tent kind of deal. And a wand toy too. You and the other girls are going to be having some fun. Take care. Great toys, Sparkle! Enjoy them in good health and maybe share, just a wee bit? ?